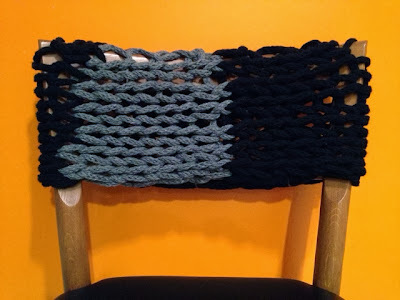 Lately I feel like I've been knitting and crocheting so much, but when I signed in to blogger to update my progress I realized I really had nothing to share! How many pictures of dish clothes do you really need to see! I have been using them, by the way. It's definitely different then using a regular sponge, but it makes me feel so happy using those colorful little swatches. My Chevron Shawl is forever in progress. I did knit several more inches, but I feel like it's not enough to really want to share yet. I'm madly in love with Knit Picks Capretta because of it. I highly recommend it. So lusciously soft! Today I decided to show off a couple of projects that have been sitting around my apartment waiting to be finished and photographed. First up is a cowl I first started talking about way back when in March of 2012. I can't believe it was that long ago. It's when I introduced Andy to the world. 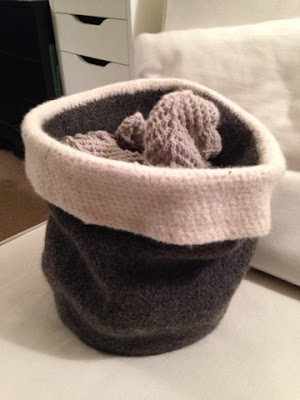 Once I was done turning worsted acrylic into super bulky acrylic I knit it up into a chunky cowl. It looked really cool except it was too chunky and stiff! Sadly, it was not worn and was draped over a chair to get it out of the way. It stayed on that chair for almost a year and a half. That's when I realized something. It looked great there! I placed the cowl in its permanent place and sewed up the top. I still wanted the option to take it off and throw it in the wash so the bottom is just tied with some left over yarn. Now it looks right. I'm not sad for that cowl anymore. 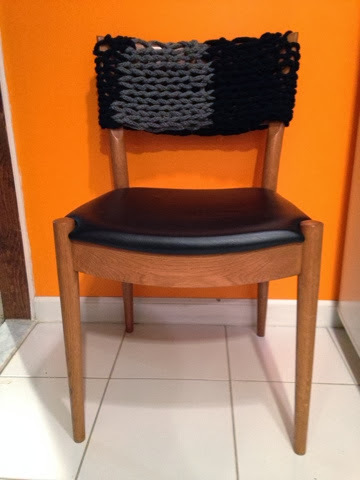 It's a happy little chair cover now. It has found its rightful place in this world. It kind of makes me want to knit more things for my home. Why should knitwear be confined to people! Let it loose! Hence my next project, the crocheted basket. I finished this guy over a month ago but I haven't gotten around to felting it until last week. I think I kept putting off the felting process because I've never done it before. I was scared. Finally I gathered enough courage to dump that sucker into a tub of hot soapy water and swished away. Ten minutes in and I thought I clearly had done something wrong. It looked loose and stretched. Another ten minutes later it happened. It started to felt. I don't know how long I really sat there crouched in my bathtub with my felting bucket but it hurt. I took a dinner break and then went right back to it. Finally the holes started closing in. A glorious fuzz has appeared! I HAVE FELTED!!! Truth be told, I probably should have felted it a bit more but whatever! I'm impatient. Now this awesome basket holds my awesome Chevron Shawl and all its wool. I'm thinking about adding handles and stitching the white brim down. We'll see. No rush. Just to update you on the dish cloth craze, I have finally finished my last dish cloth. Now I have moved on to crocheting a big mat for my drying rack. I bought two drying mats from Target but they get stinky pretty quickly. Plus they're beige and boring. Cue the color! Obviously I had to buy some more colorfully fun cotton Sugar 'n Cream! I'm only a third done with the first mat. It's going to take at least 3 balls. My Patons wool is calling me to start another basket. I hear it quietly whispering to me. Who am I to ignore it. Stitch away!!! Is anyone making things for the house and not themselves?